San Rafael, Calif.—The three-tier system can work reasonably well if you have a distributor, but if you don’t, then it doesn’t work at all. Consolidation has reduced the number of distributors, who are focused on their largest wine suppliers. The few good small distributors that remain are booked up, and the not-so-good ones may be slow to pay their bills. On top of that, a winemaker or winery owner often has to do all the selling anyway. While it’s now possible to sell direct to consumers in most states, that still keeps you off of restaurant wine lists and retail shelves. Just recently, online portals for direct-to-trade (DTT) became a real option for wineries to market their products in states where they do not have representation. Virtual DTT solutions have been tried in the past. Searching Wines & Vines’ archives, I found a June 2006 story titled “Direct-To-Trade Sales Options Could Open New Doors.” I understand that the businesses featured in that article have folded their virtual tents. This column is part of Wines & Vines’ annual Distributor Market 2018 special report and a one-year follow-up to the September 2017 report “New Digital Platforms Connect the Tiers.” I interviewed two DTT providers and four of their clients to learn what’s working. The DTT providers use different business models to help alcoholic beverage suppliers sell across state lines to retailers. Two things they have in common: for both the supplier and retailer, they look like an online wholesale store, with 24/7 automated sales and restocking; and they provide additional sales and marketing services beyond what is found on their websites. Merchant23 was launched two years ago by founder and CEO Jacob Moynihan. The company facilitates wholesale sales in every state that allows a three-tier system. Even some state agencies in control states have become clients of the company. Merchant23 carries 360 SKUs on its website and claims to sell many more privately listed wines through its system. The company uses its network of distribution partners in every state for clearing and compliance. When a purchase order is created from a retailer on the site, Merchant23 handles all logistics, clearing and compliance. Suppliers do not sign agreements with distributors, who clear the supplier’s products on an invoice-by-invoice basis. Moynihan explained that it takes just a few minutes to get set up on the Merchant23 site, where you upload your products, including images, wholesale case prices, inventories and suggested retail prices. Sellers own and warehouse their own inventory, removing the issue of wholesalers holding stock of old vintages. In contrast to Merchant23, LibDib is the wholesaler, with wholesale licenses in all states where it does business, currently California and New York, with four additional state licenses pending. Durzy plans to be licensed in every state in the next two years. 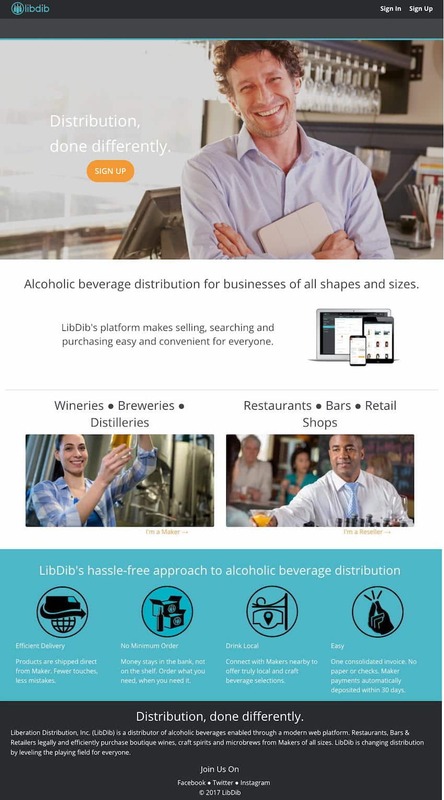 Since starting in June 2016, LibDib has grown to have 305 active suppliers with 1,822 alcoholic beverage SKUs in California, and 184 active suppliers plus 1,150 SKUs in New York, with more being added daily. Durzy offered the example of a small California winery that had a relationship with a New York restaurant but couldn’t sell it wines. Using LibDib, the winery now ships four cases every few months. The restaurant pays LibDib as the second tier, which then pays the supplier within 45 days. Durzy claimed LibDib’s margins are only 15%, as the company doesn’t own and maintain delivery trucks or warehouses. Unlike with many wholesaler agreements, wine suppliers are free to leave at will, as LibDib will not enforce franchise Laws. Delivery costs are the responsibility of the supplier/maker, who then builds them into the price. LibDib also has relationships with warehouses in both markets that can assist with storage and delivery. She now uses LibDib to bypass conventional distributors and go direct to market. Using LibDib, Murray’s sales went from zero to “several handfuls” of placements, including all 29 California and Washington locations of Total Wine & More, an account she had been working to break into for over a year. She now has a base on which to grow, making it easier to take on contract sales reps to grow the brand, and eventually storing wine in California to cut costs. By having someone else take care of compliance, paperwork and payments, Murray can focus on the relationships. “This is a sales and marketing business. You just happen to be selling wine,” she said. Making sales after giving up Along with his father, Matt Railla is co-owner of Wine Guerrilla, a single-vineyard Zinfandel specialist producing 1,000 cases a year in Santa Rosa, Calif. Before starting with Merchant23, Railla tried everything to get the attention of distributors, with minimal success. He gave up trying (does this sound familiar? ), instead focusing his time on the tasting room, which opened in 2013. His three-tier sales dropped to zero. Merchant23 was able to get a large order from Cost Plus World Market, something that would be highly unlikely in the conventional three-tier model. Cost Plus was direct-to-store shipped a high-quality wine that none of its competitors had, and Karah Estate moved some excess inventory without heavy discounting. And the best part: Kinnett was paid promptly. A small importer’s story Ami Nahari is the founder and CEO of The River Wine, based in New York state. The company distributes and produces premium kosher wines and spirits from Israel, California, Italy and Finland, with annual sales of 10,000 cases. Nahari was doing well in his home territory of New York and New Jersey but struggled in California, which should have been his second-largest market. He had some retail demand, but his distributor didn’t allocate resources to the niche kosher market, even though to Nahari it was a big market. He went to California and built sales himself, eventually getting it to $30,000 annually. These examples show that online or virtual three-tier may finally be a viable solution for the small winery and will likely only get better. And it should be a lot more efficient than those weeklong East Coast sales trips. Andy Starr, founder of StarrGreen, is an entrepreneur, marketing manager and winemaker who provides strategy, management and business development consulting services. A resident of Napa Valley, Calif., he holds a bachelor’s degree in fermentation science from the University of California, Davis, and an MBA from UCLA.